Kenneth Bowman Watson was born on Sunday, 20 June 1897 at Peel Co., Ontario, Canada. He appeared on the census of 1901 in the household of William Albert Watson at Malton, Peel Co., Ontario, Canada. He is listed as: Watson, Kenneth, male, white, son, single, born Jan 20 1897 in rural Ontario, age 3, of English origin, Canadian, Presbyterian. He appeared on the census of Tuesday, 6 June 1911 in the household of William Albert Watson at Malton, Peel Co., Ontario, Canada. He is recorded as: Watson, Kennith, male, son, single, June 1897 in Ontario, age 13, of English origin, Canadian, Methodist, attended school for 9 months, able to read, write and speak English. He joined the Royal Flying Corps in 1917 and was assigned to 28 Squadron in Italy. 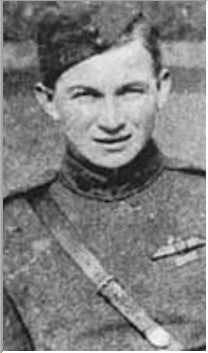 He was awarded the Distinguished Flying Cross. He appeared on the census of June 1921 in the household of James Watson Hewgill at 42 Lynd Ave., Parkdale, Toronto, York Co., Ontario, Canada. He and Hilda Victoria Darby, daughter of Frederick William Darby and Lella Elizabeth Smith, were married by Methodist Minister E. P. Addison on Thursday, 23 March 1922 at Toronto, York Co., Ontario, Canada. He was 24, bachelor, dairyman, Presbyterian, living at 42 Lynd Ave., born Ontario, able to read and write. She was 23, spinster, Church of England, living at 199 Clendenan Ave., born England, able to read and write. Wilfrid Clarence Hewgill and Thora Victoria Hewgill witnessed the marriage. Kenneth died on Monday, 5 March 1962 at the Royal Victoria Hospital, Barrie, Simcoe Co., Ontario, Canada, at age 64 years, 8 months and 13 days. He was buried in Bethesda Lutheran Cemetery, Markham, York Co., Ontario, Canada. For more information on his flying career, please visit this excellent WW1 website, The Aerodrome.